A comprehensive guide to managing one’s Web presence. Collins’ jam-packed, information-heavy nonfiction debut offers an exhaustively detailed blueprint for “cleansing and controlling search results for any name, brand, or entity search phrase.” The author, an online marketer and agency founder, asserts up front that dealing with all aspects of online representation is no longer the nerdy domain of hackers and code-wranglers—it’s become a deeply rooted part of modern life. Allowing such things to take their own course without any oversight or manipulation, he says, is an amateurish invitation for trouble. In clear, concise chapters, Collins takes readers deep into the often bewildering world of the Web and looks at the blizzard of forces that can affect a person’s or business’s online reputation, including blogs, video sites, discussion forums, government-related sites, image hubs, review sites, and, of course, the all-encompassing world of social media, where poorly or unfairly curated material can do long-term damage to personal and professional standings. Links, images, videos, ex-employee slander, “rogue” bloggers, frauds, hate sites—these and many other things can combine into a “fire hose like volume of data.” It may initially look overwhelming, but Collins asserts that it can, with patient and smart application, be controlled or suppressed. His book puts the necessary information at readers’ disposal, explaining such complex concepts as search algorithms, search engine optimization, aggressive linking strategies, and a host of website performance metrics. He asks questions (“Which links matter? Which links are stronger? What gives a link relevance, and which links are completely ignored?”) and provides carefully elaborated, patiently detailed answers. Readers who are already conversant in the world Collins describes, as well as those who can’t tell a “CTR” (click-through rate) from a “SERP” (search engine results page), will find this book intriguing and enlightening on virtually every page. These are tools that everyone who spends a significant amount of time online should use, and Collins is a fine teacher. 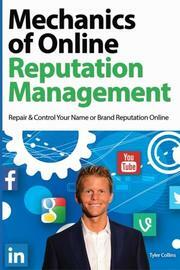 An invaluable handbook to surviving, thriving, and controlling one’s image online.